New collaboration poised to greatly accelerate the LEED® certification of new and existing metro stations. Washington, D.C.—(October 7, 2015)—Today, USGBC, GBCI and the Delhi Metrorail Corporation (DMRC) signed a groundbreaking agreement that will greatly accelerate the LEED certification of new and existing metro stations across the country. “Through this new collaboration, our organizations will work together to implement appropriate adaptations, regional credits or alternative compliance paths to incorporate the unique needs of metro installations and mass rapid transit systems for metro stations and depots within the LEED green building rating system,” said Mahesh Ramanujam, Chief Operating Officer, USGBC and President, GBCI. “DMRC is committed to leadership in the sustainable design, construction and operation of metro installations and mass rapid transit systems and this new agreement enables us to move together at a fast pace to affect real change in metro stations that are being used by millions of people every day,” added Ramanujam. 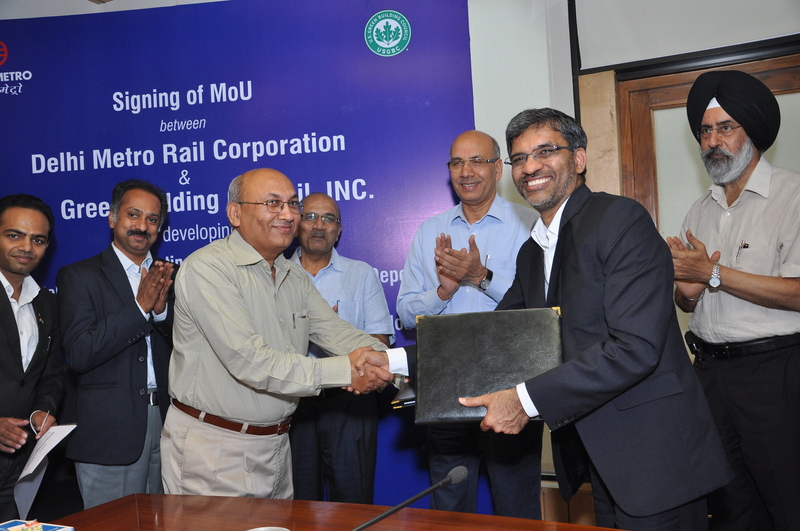 The agreement was signed today at Metro Bhawan between DMRC and USGBC. Singh and Ramanujam signed the MoU in the presence of DMRC’s Managing Director, Dr. Mangu Singh, its Director Electrical, A.K. Gupta and other senior officials. As an internationally recognized mark of excellence, LEED provides building owners and operators with a framework for identifying and implementing practical and measurable green building design, construction, operations and maintenance solutions. With more than 170,000 gross square meters certifying per day around the world, LEED is transforming the way built environments are designed, constructed and operated. LEED-certified buildings save money and resources and have a positive impact on the health of occupants, while promoting renewable, clean energy.